Do you know the song, County Fair, by Bruce Springsteen? This song epitomizes the sounds, feel and tastes of our County Fair, which just ended on Saturday, September 22. There’s nothing that smells so good, feels so good, or is so much fun as being involved in the County Fair. If you merge that involvement with something that makes a difference in our world, it’s even better. 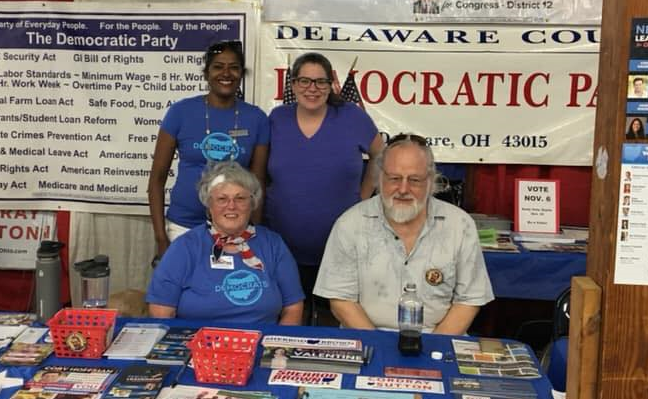 The Delaware County Democratic Party had been involved in the Delaware County Fair for decades, with support from Democratic volunteers. And this year, we increased our presence from one to two tables! What has been your most fun experience? Greg: “Working with the kids. Asking them if they ever voted before, no matter what their age. When we ask the fairgoers what their favorite fair food is, we let them vote on it, by day, and then post the winners on a board from the previous day. On the 1st Saturday of this year’s Fair, we got 171 votes! What has been your least enjoyable experience? Julie: “12 years ago, I was sitting on the floor with a new mommy who was nursing her child. An Anti-Choice man came over to our booth, shoving a pamphlet in our faces and verbally abusing us. That year, we had an Anti-Choice booth around the corner from our booth. Both: “It was upsetting with our stand-up Hillary and Barack look alikes were stolen from our booth at the 2016 fair. Ed filed a report with the Sheriff, and the two showed up at a Buckeye Valley football game. When the Sheriff called Ed and was asked if he wanted to press charges, he said no, as he thought just the embarrassment of having the sheriff take them back while all their friends and parents were there was enough penance. We were happy to find out that it was just a couple of teens and not someone who wanted to do more harm to the Democratic Party. And finally, both Julie and Greg to me that the main goal of having tables at the Fair is to show people in the community that the Democratic Party exists, we don’t have crazy ideas and that we are family people who want the best for our children. We are slowly breaking down their stereotypes.